Measurement: 32.28" x 7.68" x 7.68"
Made of heavy duty steel this spring compressor is guaranteed to compress or pause the spring in any position. This machine is designed to disassemble or assemble operations of car spring shock and can compress and pause the spring in any position. This machine is mainly composed of the gear rack notch wheel clutch and so on. 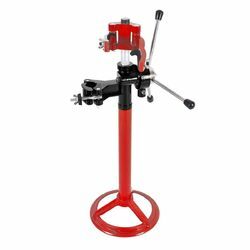 Made of solid and durable construction this tool is mainly composed of the gear rack notch wheel clutch and so on providing a reliable use in the long term. Coming with the rounded base the equipment is made for easy storage and stability. The machine can remove the spring maximum diameter reach up to 7.8" and maximum height reach up to 20" which is suitable for most springs.